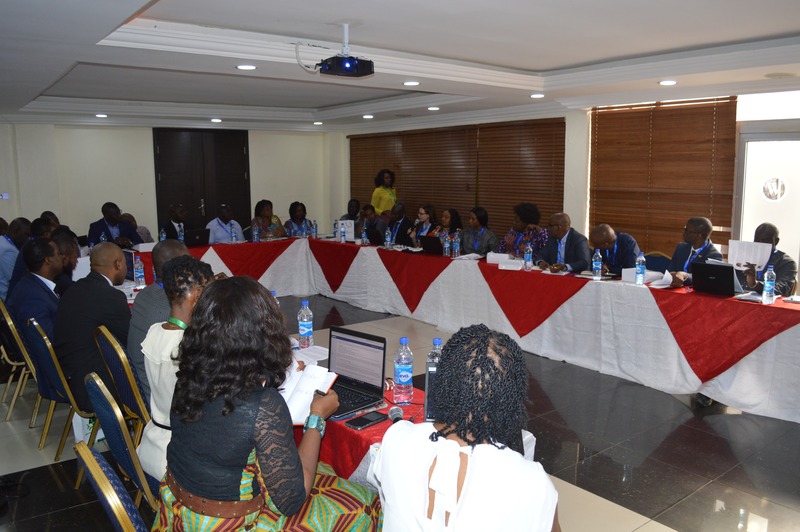 Ford Foundation’s West Africa Office, in collaboration with Spaces for Change|S4C convened a two-day learning event on Innovative Program Design and Implementation Approaches on April 12-13, 2018, in Lagos, Nigeria. Fiscal Justice is one of the Foundation’s core priorities. Along this line, the event brought together partners and grantees of the Ford Founding, comprising representatives of government agencies, local and international non-governmental organizations, research institutes, independent experts and activists to foster learning and collaboration around Ford Foundation’s new grant-making systems and priorities in the field of fiscal justice. Over the two days, the cream of 35 participants and facilitators from Ghana, Senegal, United Kingdom, United States of America and Nigeria learned how to go about strengthening their institutional operations, and more specifically, their program activities relating to fiscal justice, with particular emphasis on extractive industries (EI). Both theoretical and practical presentations expounded the ways in which individuals, community movements, global coalitions and organizations working on EI issues can take good work to scale. A group visit to the Foundation’s office in Lagos and a group dinner at the Lagoon Restaurant added recreational savor to the conference program, providing an opportunity for participants to see a bit of the city, network and develop new relationships needed to translate EI rhetoric into action on the ground. This conference report summarizes the proceedings. At the outset of the discussion on fiscal justice, it is important to have a common understanding of some specific terms that will be used repeatedly during the presentations and discussions. Mr. Tatu Ilunga, an independent tax consultant, formerly the Senior Policy Advisor for Tax and Extractive Industries at Oxfam America, began by explaining the meaning of terms like fiscal justice, taxation and accountability. His presentation, ‘Introduction to Tax, Public Accountability and Fiscal Policy in the Extractive Industries (EI) Sector’, drew the connections between fiscal policies, taxation and resource mobilization. The next presentation by Ola Bello, ‘The Power of Advocacy and Policy Influencing in the Extractive Industries Sector’, accentuated the role of the civil society in delivering the accountability agenda within the EI sector. Mr. Bello is the Executive Director of Good Governance Africa, with more than 10 years of experience in research and policy advisory on governance and extractive sector reform, sustainable development and international development cooperation. Bello’s presentation emphasized the importance of effective collaboration between policy champions on the one hand and citizens, including civil society organizations (CSOs) on the other. The latter need to support, educate, inform and enable the policy champion to ensure that he/she is able to efficiently channel their concerns within government corridors. This allows for the deployment of tested advocacy strategies emerging from the participants’ collective experience. A group activity divided participants into 5 groups: Nigeria, Ghana, Senegal, West Africa and Global. Each group carried out a context analysis of the country/region in focus, mapping out the current EI challenges and opportunities for change. It is important for grantees to know how frame fiscal justice issues in order to align with FF priorities. They need to have a firm understanding of the fiscal justice issues affecting communities that need to be addressed; the kind of activities that could bring about the needed changes and the indicators of success (to ascertain that the changes needed have occurred). The second day of the conference started with Eva Kouka’s presentation highlighting essential tips for maximizing communication with the Foundation. Ms. Eva Kouka, the Foundation’s Program Officer on Fiscal Justice added that the event aims to foster learning and collaboration among partners and organizations working across the continent, demanding transparency and accountability for the management of public resources. Bearing in mind that Ford Foundation exists because of the grantees, one of the meeting’s utmost objectives is to enable grantees establish links between their priorities and the priorities of the Foundation. “Who is missing?” This is a question that is often ignored when decisions are being made. As findings from the plenary sessions and group activities suggest, women in particular are left out of important policy deliberations where decisions affecting them and the governance of extractive resources are made. In order to reverse this trend, Juliana Iregbu, an independent expert canvassed for a streamlining of the social contract between government and women. This is necessary to ensure that the disparate needs of women as mothers, wives and citizens, are catered for. Where this happens, it eases the process of determining whether national budgets work for women and whether implementation processes are inclusive of the gender agenda. From that conversation around DEI, discussions moved to the importance of having a strategic communications strategy for civil society organizations. Victoria Ibezim-Ohaeri, the executive director of Spaces for Change | S4C led the discussions with a presentation highlighting S4C’s strategic communication approach which is informed by the organization’s historical trajectory. FF works to support organizations on a long-term basis, while building their institutional capacity and strengthening their practices. This conference was a first step to bring news of the recent changes to Ford Foundation’s grantmaking on fiscal justice to the attention of grantees and partners in Africa. The completed evaluations indicated that participants learned a great deal from the two-day session and from each other, and are still yearning to learn much more! S4C’s Victoria Ohaeri and Eva Kouka’s closing remarks emphasized that most of the enriching debate and arguments made during the two days illuminates the need for the civil society to take gender diversity and inclusion, smart program designing, strategic communications and institution-building more seriously. Coupled with the importance of diversifying funding streams, institutional performance and accountability will be the major factors that will make an organization stand out from the rest.